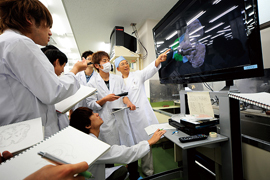 The School of Medicine was established as a Prefectural University for accomplishing the mission of leading Fukushima’s regional medicine. For more than 60 years, we have fostered medical professionals with high standards of knowledge and skill, and contributed to our residents’ and citizens’ health and welfare. Today, advanced medical technology is developing rapidly by applying the latest life science knowledge and techniques. We are now approaching the task of serving an aging society, and how to make more people maintain healthy lives longer. Our residents’ expectations of us is becoming greater than ever. We are responsible for quickly and accurately meeting to our citizens’ expectations, and fostering medical professionals with outstanding knowledge and skills. At the same time, we must continue to solve universal challenges and transmit our achievement to the world. Our “Vision 2014” urges us to foster “skillful medical professionals who will contribute to reconstructing Fukushima” and “medical professionals with high standards of knowledge, skill and morality”. This new vision reflects our determination for developing and contributing to medicine for our residents. We will give new solutions to how we can reassure our residents who want to live healthy lives, and what we should do in order to accomplish this, based on our experience and tradition. The School of Medicine encourages students to become intelligent and compassionate doctors who exercise their own skills, pursue harmony, and create better communities. We will foster doctors who can feel compassion, acquire knowledge, use skills, work harmoniously, and create community. Having sincere respect for life. Having high morality and expressive compassion. Having broad mindedness and appropriate decision making capacity. Having scientific interest and creativity. Having passion towards contributing to community and reconstructing Fukushima from the Great East Japan Earthquake.